So Google has broken into the Instant Messaging (IM) market now. 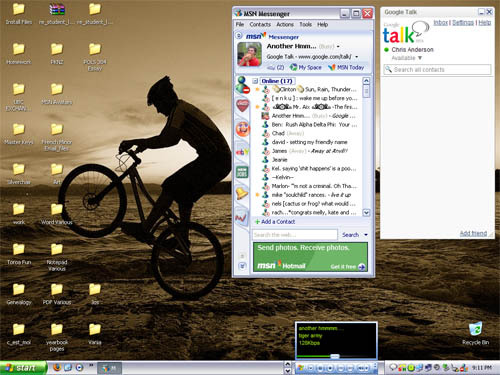 Google Talk is not only an instant messaging system but also competes with internet phone services such as Skype which have started becoming quite popular lately. It may prove to be much better than trying a webcam convo with someone on MSN Messenger or Yahoo Messenger which, for some people, crash on a regular basis with a webcam running. Right now Google Talk is a trial version, and you need a Gmail account to sign in, but getting a Gmail account has become almost as easy as getting a Hotmail account – just ask anyone with a Gmail account (like me) to invite you. Here’s what the beta version of Google Talk looks like on my desktop – no frills at all. The desktop background is a local BC rider in Victoria, photo taken by Dave Lang and can be downloaded from HERE.